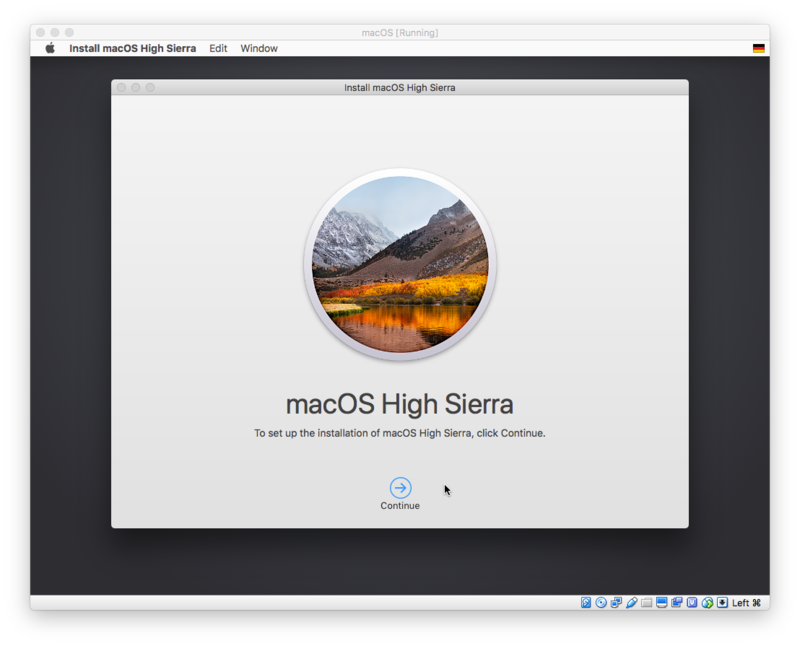 VirtualBox: How to create a macOS High Sierra VM to run on a Mac host system « TOBI WAS HERE! how I get the password? you don‘t need a password? Great! All the other tutorials I found on the web got stuck at the “Boot Failed. Mac OS X” step. Thank you! Geiler Typ. Thanks a lot! Seems to work! When I start the VM im virtualbox I get a reboot after a while which is infinite. Last message has something to do with wrong Power Management. Great guide, thanks for that! I needed to press F12 after starting the VM for the first time, otherwise the VM wouldn’t boot from the disk. Followed all the steps but get a blank black screen at start up… does not take me to the language chooser. I have tried pressing F12 also… stuck – any help? 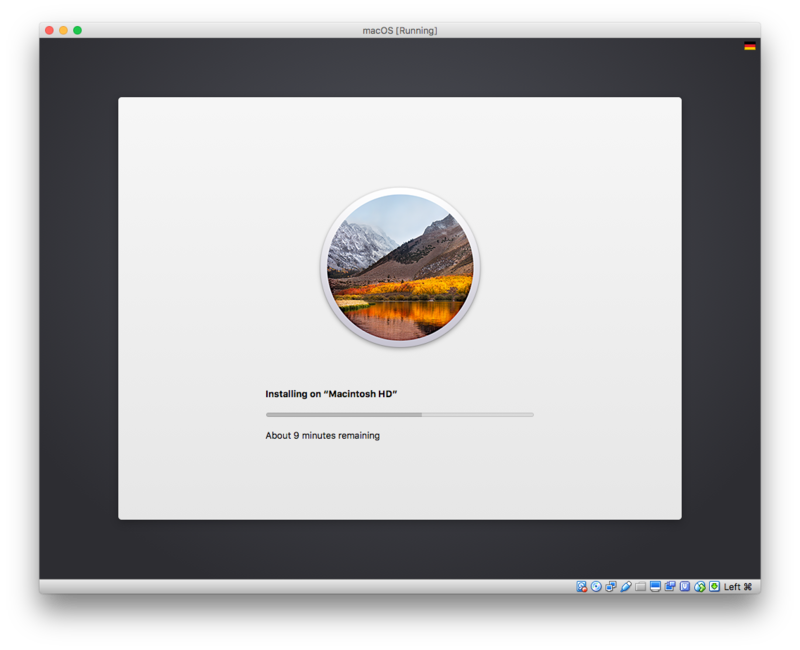 it can take some time to boot into the installer, did you wait for at least 5-10 minutes? Your CPU might be too new for VirtualBox to handle correctly. See if the instructions from https://forums.virtualbox.org/viewtopic.php?f=22&t=85631#p407278 can help you, primarily the “–cpu-profile” modification option. Thanks for this! I was stuck with the problem with the first boot. I also had problems converting the .cdr.dmg to an .iso file, always kept having errors. 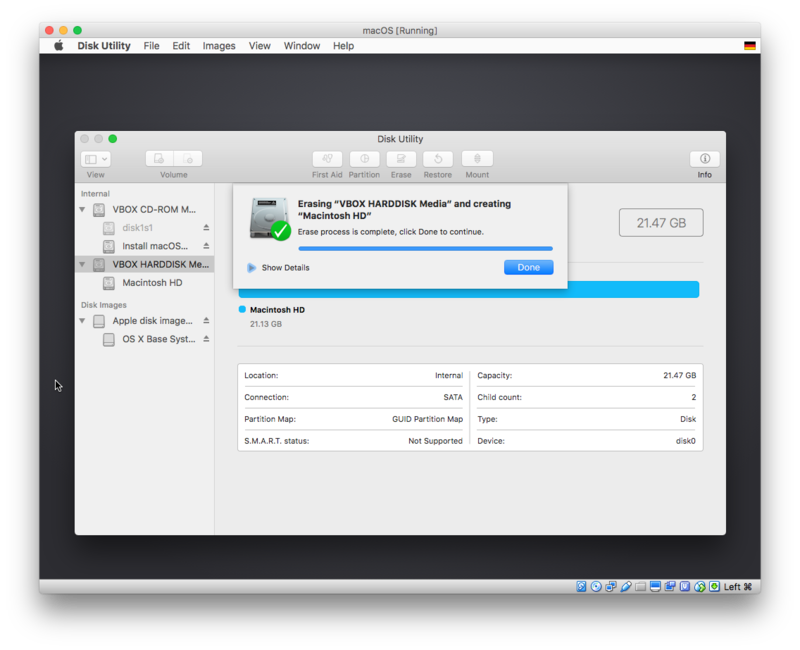 I went around the problem by copying the file to an external drive and doing the convert from there – worked like a charm. 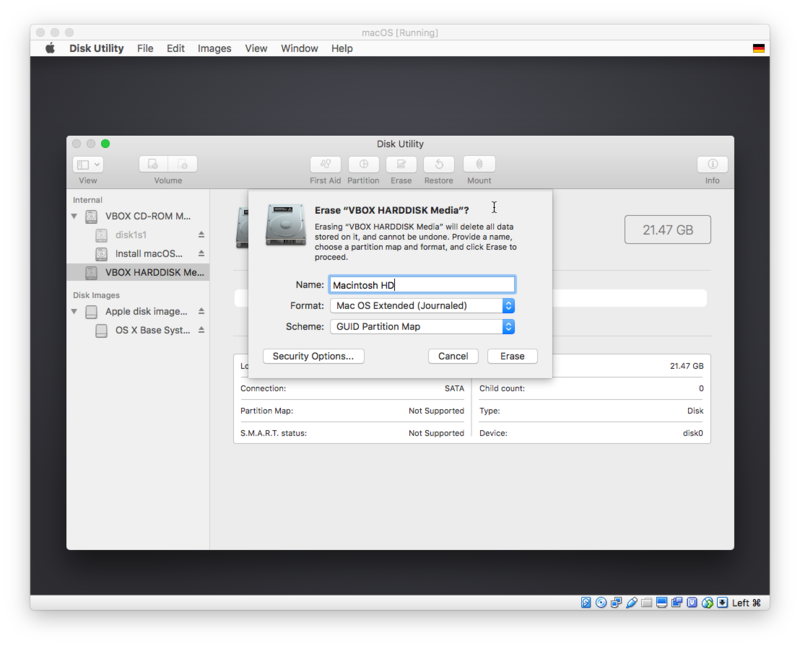 Once I erased the created partition via Disk utility GUI -> I was able to proceed. I just did the “boot.efi” trick again. Thanks a lot it worked . . . Thank you for this instruction. I think thats the best google result that google has given to me today. THANK YOU SO MUCH!! I got stuck at the failed boot and none of the other installs directions mentioned that part. 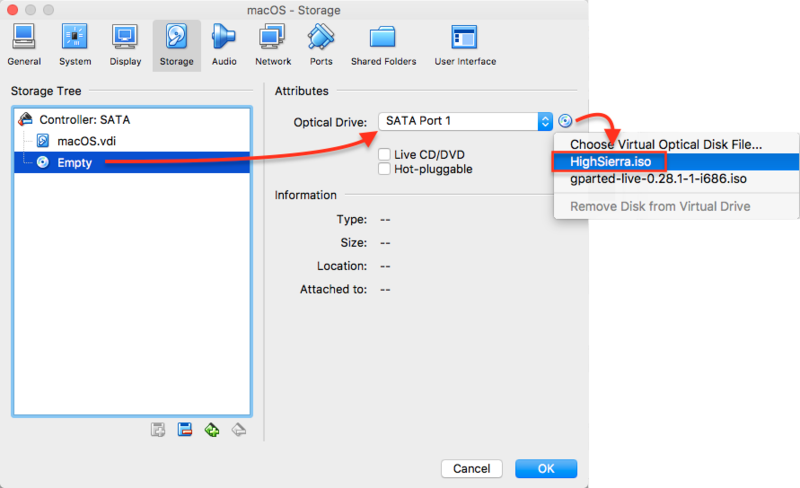 but when I shut it down to change some settings in VirtualBox and reopened it, I had to do Install High Serria again starting from Part two, is it because I changed some settings in VirtualBox? Depends on the settings you have changed, can you provide more details? I just changed the specs and CPUs, to add there four boot orders I could choose from (weird). Thank you! You helped me a lot. Do you know if I can also use this same iso file to install the HS in the VMWare? I think that should be possible, although I‘m not a VMware user. I have a problem: after I installed and updated the system, when I turn off and turn on again the VM, the black screen that appeared when I installed at the 1st time was showed again and the installation windows appears when the VM loaded. I found the problem but I don’t know how to solve it. I had to define the initialization disk on this screen. What I need to do to keep this setup? Another doubt: how to install the “Guest Additions” on Mac? I need to resize the window and keep it with 1280×720 resolution. Thanks. 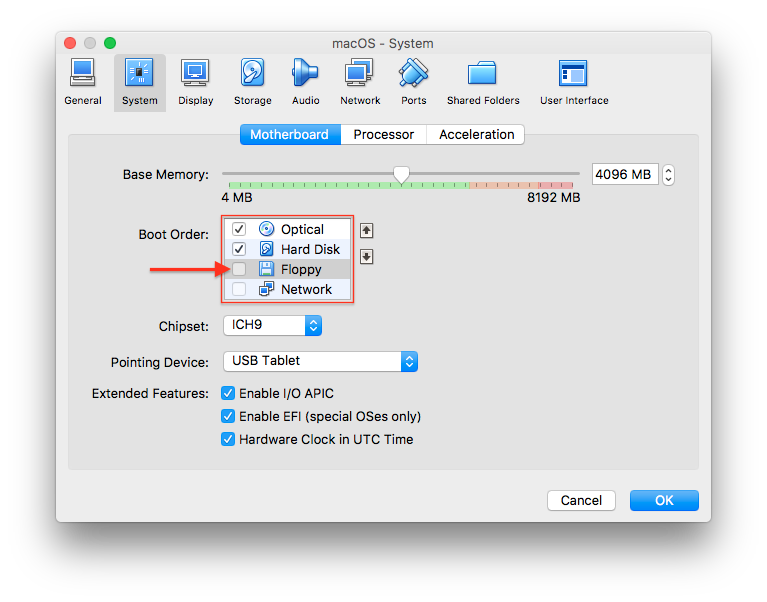 Have a look into your VM EFI options. There is some option to define where to boot from. Thanks for answering, Tobi. I read the post you cited but I did not find there a solution for me. I need to open a 1280×720 window vm and I saw only another dimensions (Where N can be one of 0,1,2,3,4 referring to the 640×480, 800×600, 1024×768, 1280×1024, 1440×900 screen resolution respectively.). Do you know if I can open this exactly dimension (1280×720)? Fantastic Step by Step Guide, could not have managed without it! Just have one small issue, the Graphics are not working like I expected, I have a new MacBookPro with Touchbar in 15″ and the screen I set only covers 2/3 or so. Do you have a trick, to fix that? Thank you for detail guide and for the boot manager trick. That saved a lot of time!!! Thought i am trying on 10.13.2 new installation, No other setups but cant get the sudo /App script to work. Worked great for me on my MBP11,3. Thank you very much!! But, significantly, you didn’t mention anything about the networking. It is important to choose the right network adapter, and “Intel PRO/1000 MT Server (82545EM)” worked for me using NAT (though Bridged would probably work as well). If you select an incompatible adapter (like the MT Desktop), you will be presented with a page titled: “How Do You Connect?” and you will need to choose the ‘not connected’ option. This will be a problem later if you decide you do want to have access to the internet, and change the network settings in VB. My experience indicates that this will likely force the boot sequence to display the re-install screen on when you boot. Thank you for this hint. I left the network default and didn‘t have any problems with connection to the Internet from within the VM. He didn’t also mention that you should boot from the floppy. Did he have to? Of course not! Followed all of your instructions upto right after to creating the VM. When starting the VM, the initial boot just keeps looping. Ending with a message like “Please switch to XPC or bottstrap_check():…” Any ideas on what is happening here and how to fix it? Thanks. 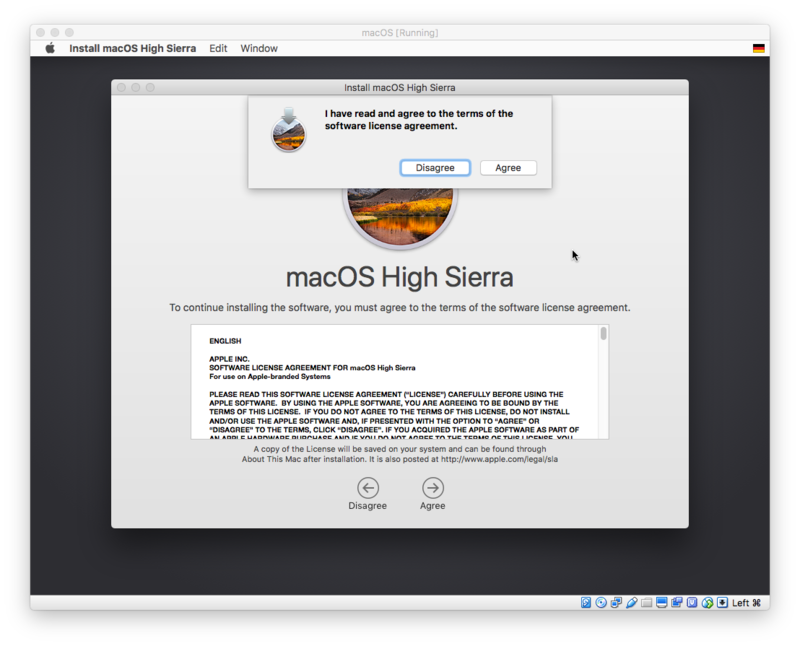 created iso from High Sierra installer as of January 2018. I had the same issue. Running the commands in the “Adding some code” section of this article (https://www.pcsteps.com/2157-mac-os-x-virtual-machine-vmware-player) worked for me. Great tutorial. Worked perfectly for me. Thanks a lot. Thx for this good Tutorial! Articles such as this is a huge benefit to everyone. 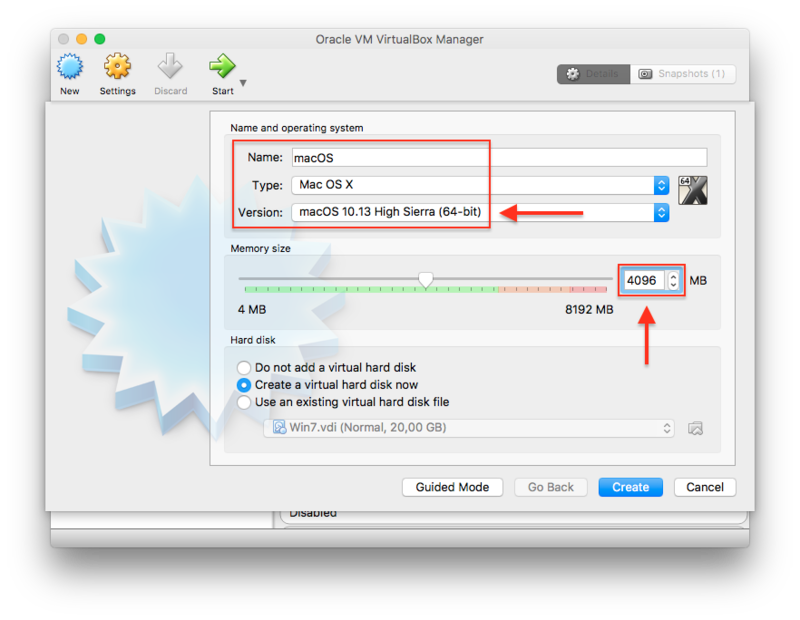 I would like to install VM Mac OS 10.8.5. 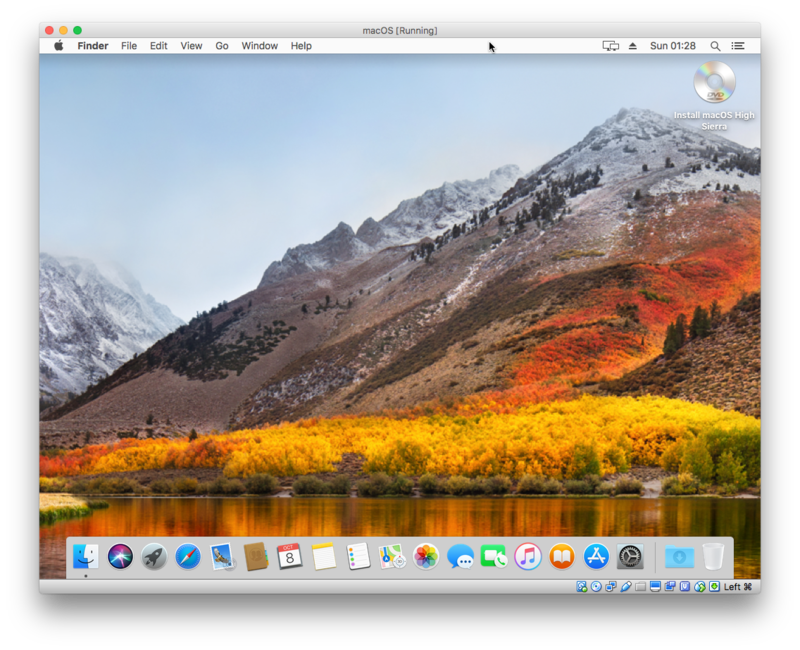 I am running my Mac on High Sierra 10.3.2. Would the procedure be the same as you explained here? Wie bekomme ich das fertige Image denn denn auf einem Virtualbox unter Windows 7 / 10 zum funktionieren? Wenn ich das Image kopiere und starte, führt das dort in eine Bootschleife. Muss man da noch was anders machen? Das ist aus lizenztechnischen Gründen so. Laut Apple EULA ist es nicht erlaubt macOS auf nicht-Apple Hardware zu installieren (Virtualisierung eingeschlossen). Great article. I saw other people as the question but did not see an answer. After reboot the VM wants to start from installation again. What needs to change that it boots into the already installed Mac OS? 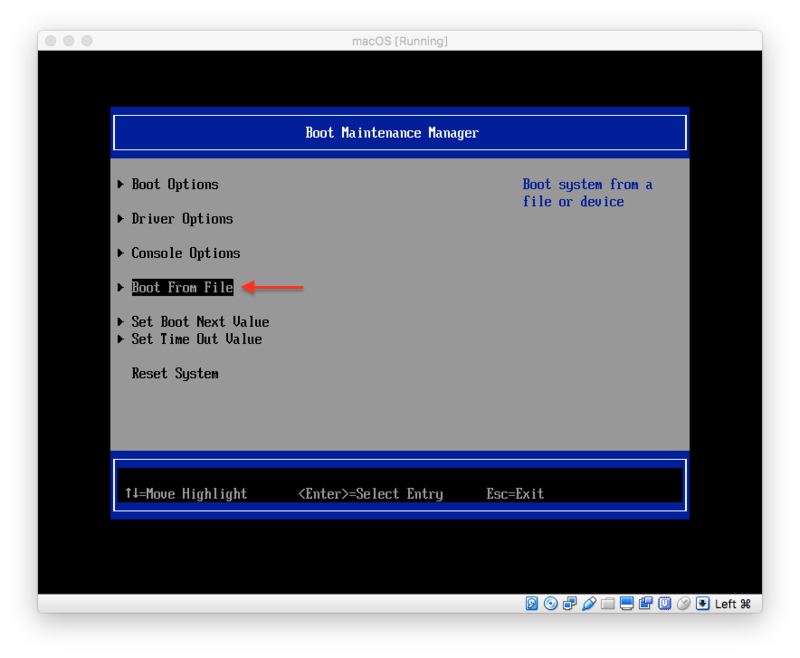 have you changed the boot order to HDD in the setting of the VM or have you removed the ISO from the virtual disc device? I floowed the whole process with success till the end but after all the steps the VM is not starting. I get “UEFI Interactive Shell v2.1″….”press ESC to skip startup.msh or any key to continue”. 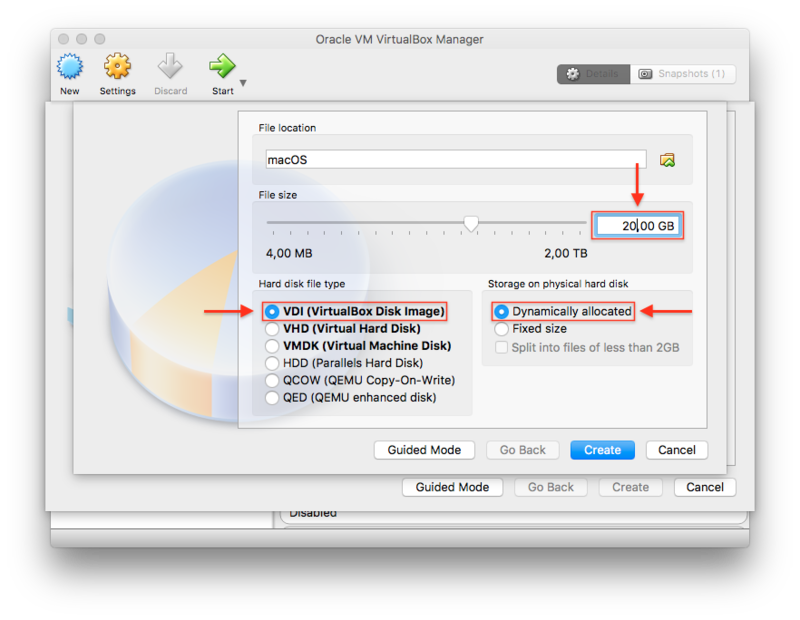 I’ve removed the disk image e changed the priority in the VM options. I also tried to boot from “EFI Hard Drive” and “EFI Internal Shell” but didn’t work. Can you help me? I’m having this issue aswell…Anyone has some help? It unfortunately means the .ISO wasn’t created correctly. The same thing happened to me with the above instructions. 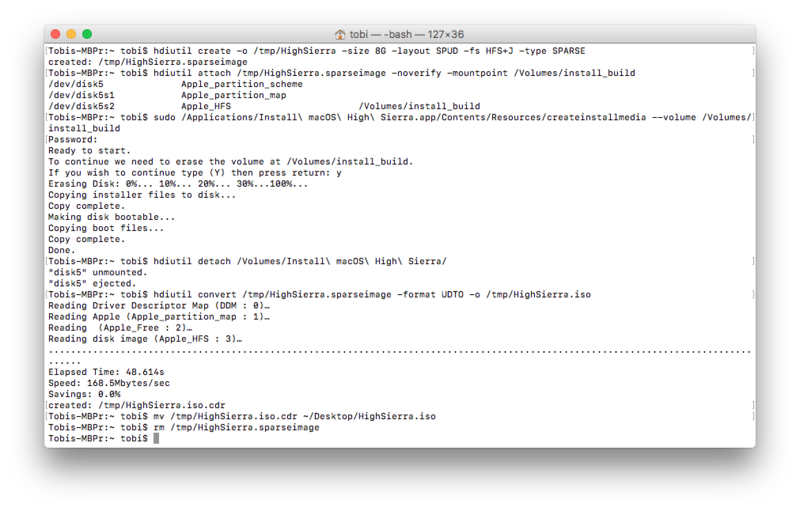 For the life of me, I can NOT create a bootable high sierra no matter what tutorials I use. 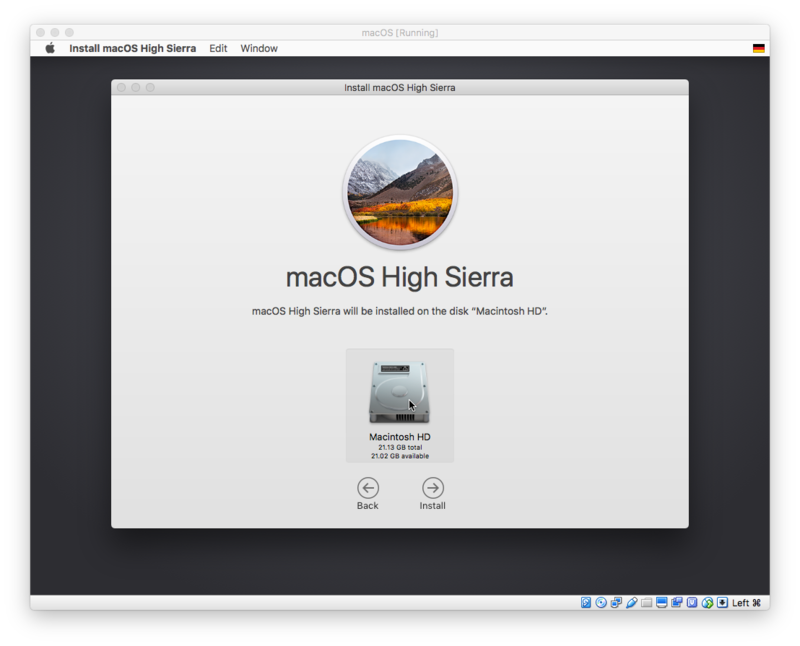 However my regular Sierra .iso boots fine with these Virtual Box settings so that’s cool I guess. What‘s your host system? Windows? I wanted to thank you as well! Every step is so well explained! Finally I can test my post install script on high sierra. I wish you a great day sir. Excellent guide, the only one that works for me for all the google results provided. this is helpful for me, thx! Thanks so much for posting this! Without it I would have never gotten my VM machine to run! Excellent work! Thank you very much, you saved me days of try and errors ! Thanks a ton! This was absolutely perfect! 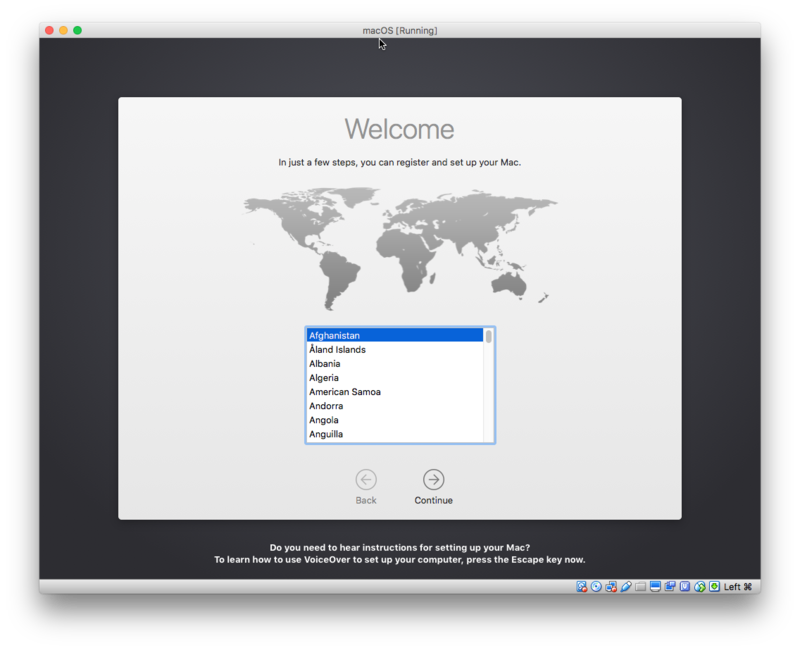 Just tried this … using Mac OS as host, and Mac Os 10.13.3 running vbox 5.28. All worked nice. The important thing here: you only need to remove the installation ISO. Then there is no need to “hurry” at all. Because then vbox tries to boot from the virtual disk, will fail, and then the rest of your explanations kick in. at with moment do you remove the installation ISO? Just like to say “Many Thanks”! 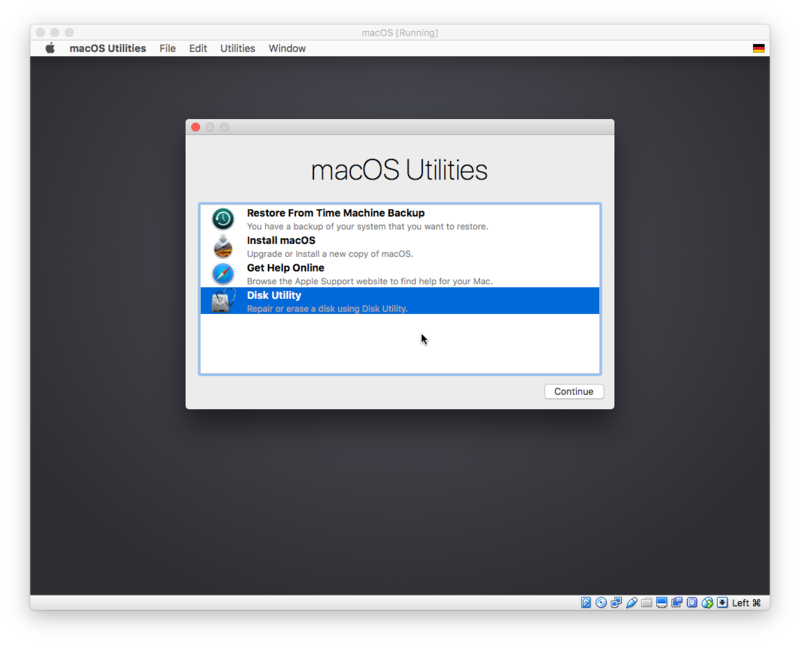 Mac OS vm has been the most challenged one, and I’ve followed many instructions and yours is the only one that works. Thanks again for a great, details instructions. Thanks so much for this! 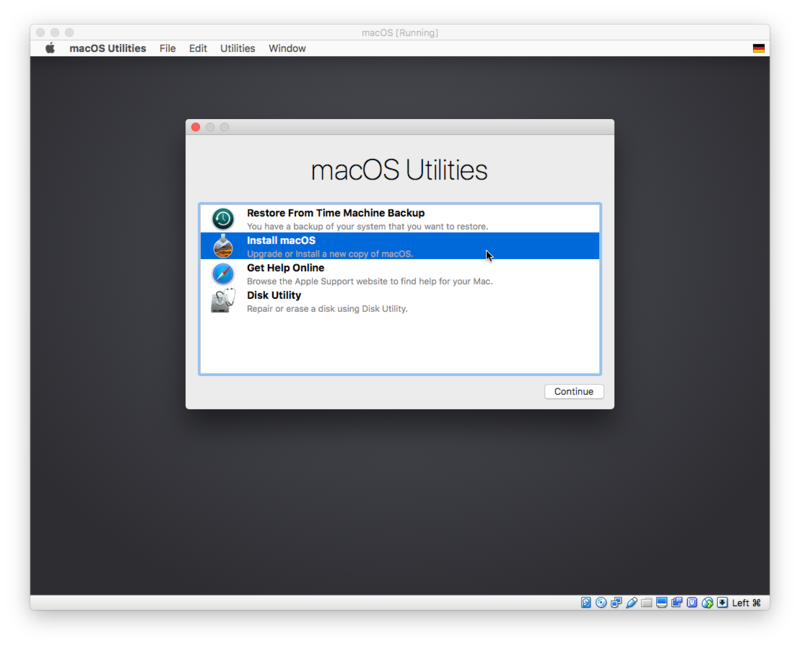 Saved me having to by VMWare Fusion to run a Mac inside my Mac. I’m using this to check I can get my developers up-to-speed on their clean machines. What went wrong under the hood and what do I have to tweak to get it into booting the new system ?? where do I find it? in the guest system or somewhere in VB? In the guest macosx 10.12 I don’t find a 10.13 startup disk . . . 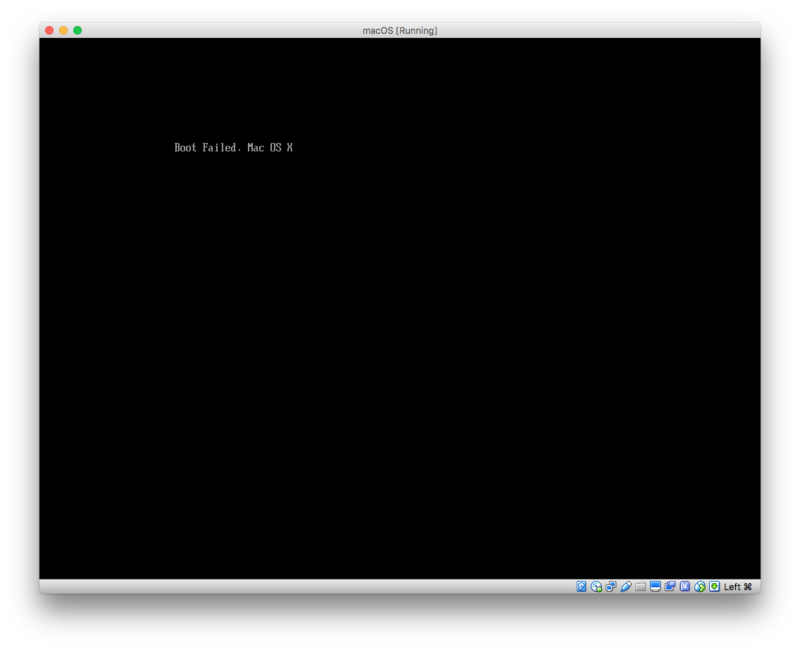 I come to the part where HS installs itself but then does not reboot for the “first run wizard” I get a shell command line. Trying to re-apply F12 method the …HD(2,GPT)… is no longer present. Any solutions? I’ve not seen the definitive answer to the vm looping through the install process again after a restart or power on after shutdown. I did the F12 and everything. I made sure I set the correct drive (the Mac HDD) as the startup disk both in System Preferences and during the boot as the link to Apple support indicates, but still having issue. now it has stopped completely at “libBootCache: unable to get playiist for /var/db/dslocal/nodes/Default/sqlindex-wal: 2 No such file or directory”. I saw someone ask if they changed the boot order or any other settings. In my case I have don’t nothing but restart. This is third time going through the process. I did initially reset the order for startup to put HDD in front of the CD drive that still has the ISO installer. One time I did take out the installer, but every time, I keep coming to the same problem and errors. I have just selected the boot.efi file and the process gets hanged on a black screen and I do not see the second part of the installation. Any ideas? Can anyone help with the system update process once onto 10.13.3.. as the standard update to 10.13.4 proceeds but then reboots into the main OS rather than the update process. However..at this point I don’t see any additional EFI boot files I can select in order to get into the update process. Mate you’re a life saver thank you so much for this detailed guide and all the shortcuts for copy paste. You sir are an amazing person! This is unbelievable. I am going to host a wiki detailing my technical conquests, as trivial as they may be in comparison, from this day forward, as a tribute to this page. You have not only accomplished an awesome feat of technological acrobatics but have also authoritatively demonstrated how to make a how-to! Can’t wait for work to see this! 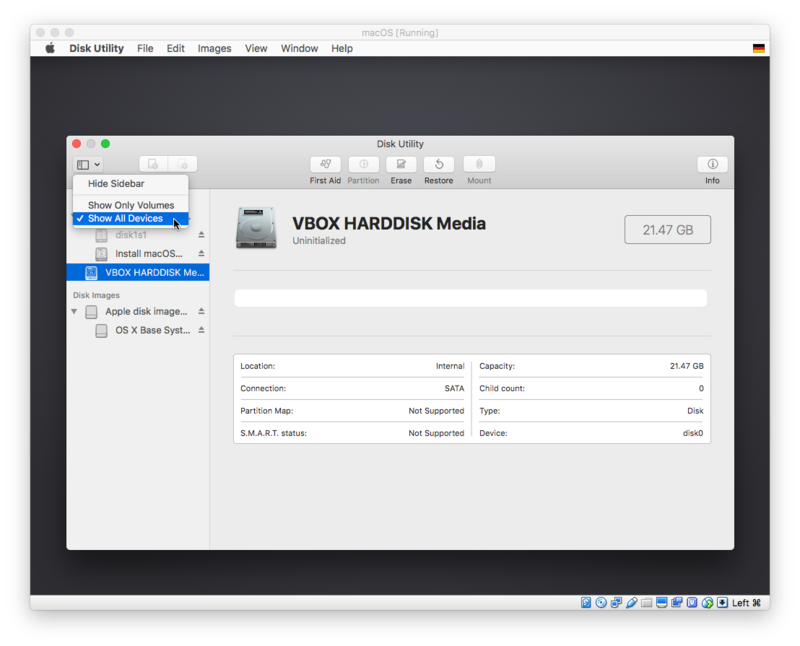 Is there a way one can install VirtualBox guest additions into the MacOS VM. They are not available for macOS as far as I know. Have you done every step as described in the article? Need to install french keyboard? When asked to press the key at the right side of the left Shift key (which is the ” (instead of the single “<" key). That will do the trick, else you will be stuck with a misconfigured french keyboard with @ and < switched. arghh wtf! why does it convert all my writings? However, I got stuck at part 2. After I had chosen boot.efi the screen goes blank, a flat cursor appears, and that’s it. I have waited some 20 minutes, but nothing changes. Does anyone have any tips for this? Ok, after a lot of testing I found a solution. I have added a new boot option: to boot from that boot.efi described above. I moved that new boot option to the top, and then it booted properly to the second part of the installation. How does it work with upgrades? 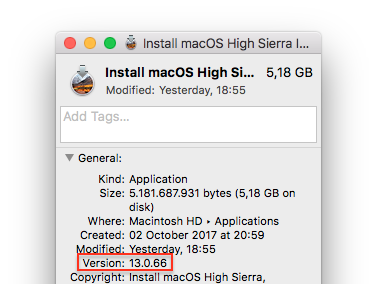 is there something that needs to be done or i can just update to new version of high Sierra ? as in to 10,13,3 to 10.13.4 for example. will a simple new version 10.14 also update or does this need to be installed again separately ? For minor updates (10.13.x): I have tried to update the system via the app store, but afterwards the VM was completely broken and didn‘t boot up anymore. Danke for that, first time trying on a VM and I have to say I spent a few hours on it with the problems I encountered, especially that one. All clear, smooth and well detailed. Bravo! So it appears 10.14 Mojave will install and convert to APFS no matter what. So unless VirtualBox supports APFS, it seems to be stuck. Anyone know how to have an iPhone connect to the VM without crashing the VM? Rezept für vollständige Freude. Sehr vielen Dank! Is it safe to delete both the installation files (the .iso and the install application)? Absolutely! Your VM boots from it‘s own virtual hard disk, which contains all the system files it needs to boot up. Thanks tons! I tried several other approaches that I found on the web. Yours was the first that worked. Hello there. Thanks for the tutorial, very easy to follow. I have a problem, though. 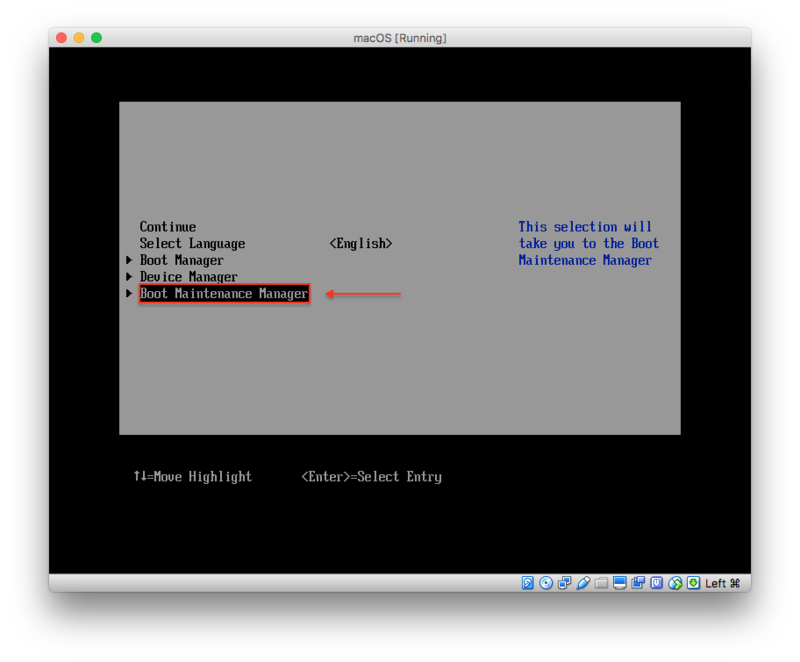 My Virtualbox boot manager has only one entry (the one that has HD(1,GPT)). 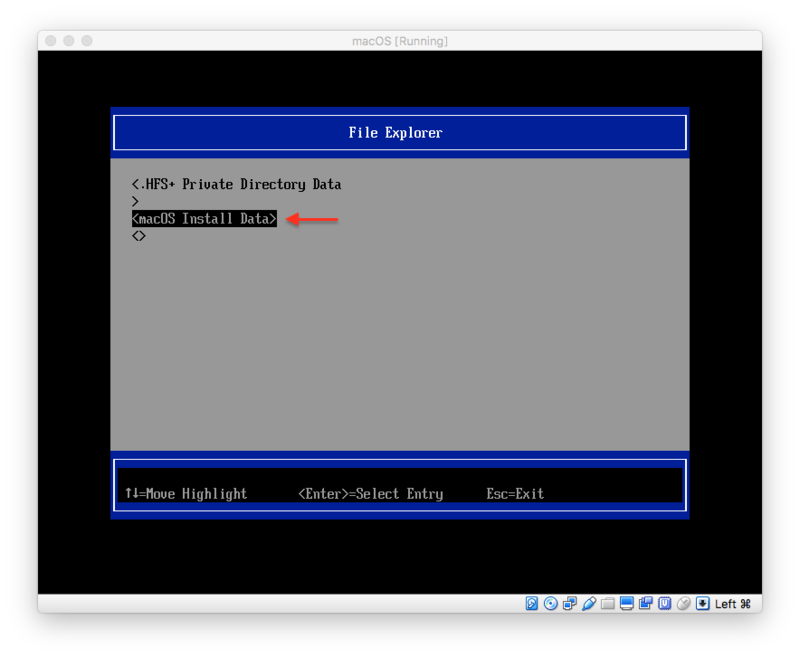 Have your formated the virtual disk as an AFP volume? Tobi – no questions here, I just wanted to say thank you so much for this guide! Your instructions on generating a .iso that VirtualBox can boot from were invaluable, and I also would never have been able to figure out the “Boot Maintenance Manager” portion of the install process. All the best! Just did it on the latest versions of MacOs, VirtualBox and VB Extension! Thank you for being so thorough with this tutorial. I was able to get the latest MacOs installed with no problems! Thank you so much for preparing this. Just found your article. Extremely useful! Very thorough and clearly written. This was a *huge* help and time saver for me. Thank you! Many thanks for posting this. After wasting nearly a week battling qemu with no luck – this worked right away. Should we ever meet – beers on me! Danke Tobi, hat sehr geholfen. Just go to your application folder and Drag the file to the prompt after Sudo … You will have to add Contents/Resources/createinstallmedia –volume /Volumes/install_build after but it fills in the full system path to the file when making the media. Great Walkthrough Though FN + F12 on Most apple keyboards will now give you the Volume option Just using F12 worked for me after using the “Reboot” option from the Part 1 Reboot. Using CMD R doesn’t give enough time to lock your keyboard into the screen for use. How did you disable it? Via csrutil disable in recovery mode? Try to reboot directly from recovery, without shuting down, to see if its persists. Since the setting is stored in NVRAM (which VirtualBox has to provide virtually as well, there could be a problem, that it‘s not able to emulate it properly). Thank you. This worked like a charm for me. However, I seem to have an issue when there’s updates on the MacOS. I use xCode/Visual Studio etc and from time to time, Apple pushes it’s updates. The update will download from the App Store, however once you reboot to “install” the VM just reboots, no update is installed and the App Store tells you there’s still updates outstanding. Do you perhaps know how to get around this? Big Thanks! Managed to set up everything following these steps. After getting High Sierra installed, it seems that there is a security update I need to run. Unfortunately it downloads the security update, starts installing it, then seems to fail and reboots itself. Only to find the security update not installed. How can I install a security update? Your guide worked perfectly! Very straightforward and easy to follow. Thanks for taking the time to write this! The “do not activate SSD” and the “be quick to fn+F12” part was my savior! Thank you, thank you, thank you! 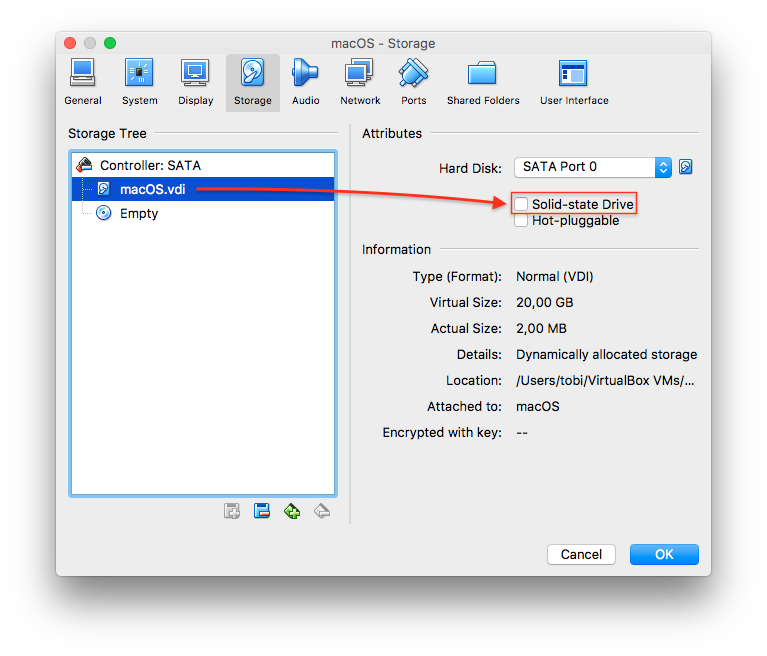 – Use the same technique of “quick fn+F12” at “Installation of macOS High Sierra Part 2” section of this article. If the update repeats downloading and feels like you’re having a deja vu, then once the update files were download, do not let it reboot by itself. Delay it, and shut down by your self. Then do the same “quick fn+F12” thing in “Installation of macOS High Sierra Part 2” section. In “Boot from file” there will be a 3rd new entry. But that’s the recovery boot image so choose the 2nd one. I suggest to take a snapshot before any update but hope this will help somebody. Outstanding. Das war wunderbar. Many Thanks for this guide. Häufige Fragen & Antworten zu Apple Pay in Deutschland » « macOS: welche Dateien legt ein pkg-Installer an?